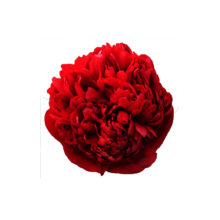 The variety of red peonies is almost endless. Still, the search for the perfect colour of red has not ended yet. One of the most successful finds is Christmas Velvet. The bright red colour symbolises passion and fierceness. This colour spectacle is exactly what you could expect from Christmas Velvet in your vase in December. The ultimate Christmas peony in our opinion. Christmas Velvet was discovered by Anderson. He registered her in 1992. Our Christmas Velvet peonies grow in countries in the Southern Hemisphere. When is peony grown in Chile or New Zealand, we get the flower delivered around Christmas. Then it is the perfect peony for the Christmas holiday. In the main season, this peony is at its best, though we prefer bigger varieties. For example, Old Faithful, Belgravia and Command Performance which are a bit more ‘fierce’.